Here are two wonderful recent commissions from George Perez! 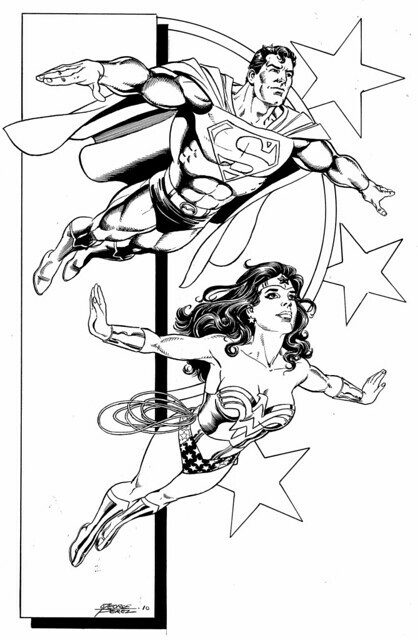 First up is this nifty illustration of Superman and Wonder Woman flying together. They are the royal couple of the DC Universe. Next is this great pen and ink drawing of the 1970s era Avengers team. The Vision, Scarlet Witch, Wonder Man, Beast, and Wasp are all represented. Along with a few characters who made very brief appearances, like the Falcon. Can’t recall Mockingbird being around at the time, but it’s nice to see her alongside Hawkeye. Check out the George Perez Facebook Fan Page for more good stuff. Nuff Said!